These instructions were based on experience with one example of the Exo Terra hygrometer. Due to variances in manufacturing and end-user ability, they might not work for you. 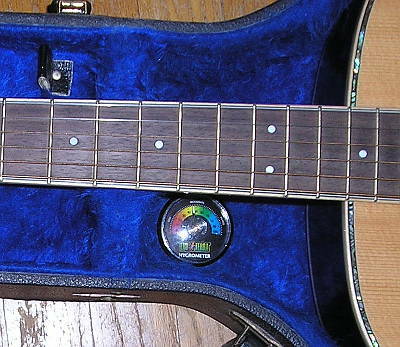 I purchased an Exo Terra hygrometer to monitor the humidity in a guitar case but regardless of what you use it for, it'll need calibration. The one I received was off by several percentage points. In this price range, you shouldn't expect anything like accuracy but there are work-arounds when (not if) you discover yours is way off. To calibrate it you can use a recently certified calibrated hygrometer or the wet salt test or you can make a Sling Psychrometer. Instructions for the latter two options can be found with web searches. Either will be accurate for the purpose. When you've determined the exact number of percentage points the indicator is off by, make a note of it. You can then either add or subtract the appropriate amount to or from the readings each time you look at the unit. With a little more work, you can adjust the unit to give an accurate reading but you do so at your own risk. These lowest-end units are not intended to be adjustable. However, if you damage it, you're not out much cash. You can typically pick these analog terrarium hygrometers up for less than US$5. To adjust it, you'll need to insert a jeweler's screwdriver or small nail through one of the holes in the back, being careful not to touch the coil, and push the bezel out of the housing. The one on my unit popped out easily. 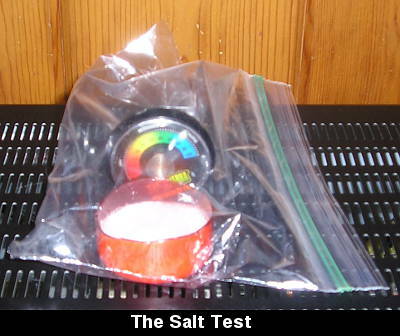 Allow the indicator to stabilize for half an hour or so after handling it, or for at least a few hours after doing the salt test, with the bezel off. The end of the coil is crimped into a slot in the brass coil mount. The one I received, had enough of the slot remaining to turn the mount with a jeweler's screwdriver or knife blade. You can also use a small pair of pliers if the slot is completely closed. Be careful not to pry it open and be very careful not to damage or even touch the coil. Be aware that the coil mount is attached to thin paper card stock which may tear if you push too hard on it. The heat and humidity from your hands will likely affect the reading so work quickly and carefully. Turn the coil mount until you've moved the indicator the number of percentage points it was off by. It will help to hold your breath while you work. When you have it adjusted, breathe, replace the bezel and you're good to go. You may notice that compared to a digital hygrometer, this analog one will be a little slow to react and may lag behind a percent or two when the humidity has changed from either going up or down. If you ever really doubt the readings, recalibrate.